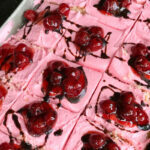 This Chocolate Covered Cherry Snack Cake is a decadent addition to your Valentine’s Day dessert. 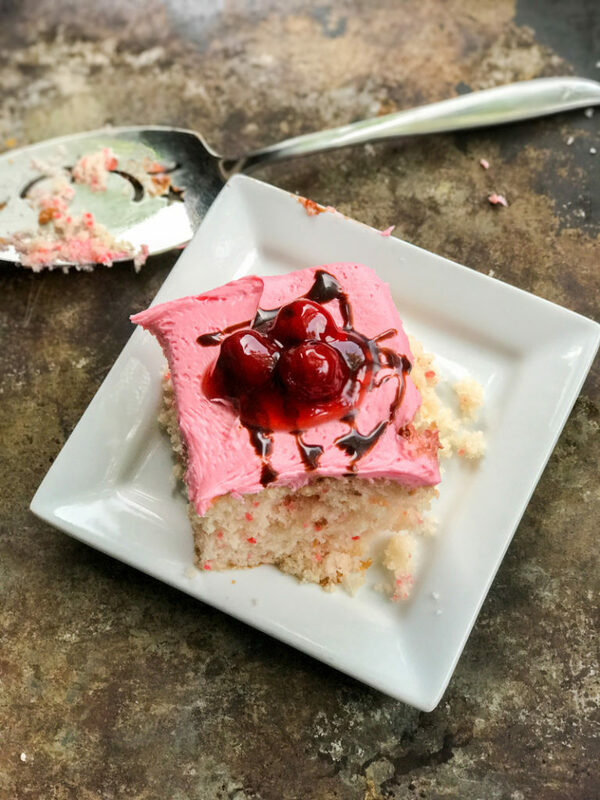 Take a simple box cake mix and doctor it up a little to serve a delicious cake that is great anytime you want a little cherry goodness. We don’t traditionally go out to eat on Valentine’s Day, simply because we like to avoid the crowds. We might go out to celebrate but it will be on a different day, so the day of, since we have kids too, we tend to just stay at home. We like to take time in the kitchen to make a meal together, enjoy a glass of wine and make a homemade dessert. 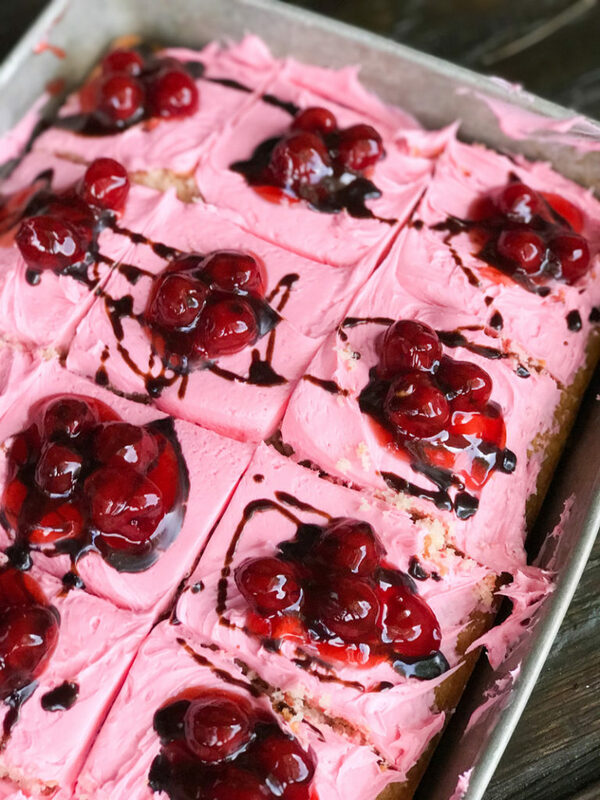 This Chocolate Covered Cherry Snack Cake is on our dessert menu this year because it’s a real favorite. I admit we make this throughout the year, but the colors make it festive and perfect for Valentine’s Day. It’s a fairly light and fluffy dessert, nice and moist which is all due to the addition of the nonfat yogurt. Helps cut calories a bit so enjoying a decadent dessert doesn’t have to be wrong. Because there is nothing wrong about it, Chocolate Covered Cherry Snack Cake is oh so very right. 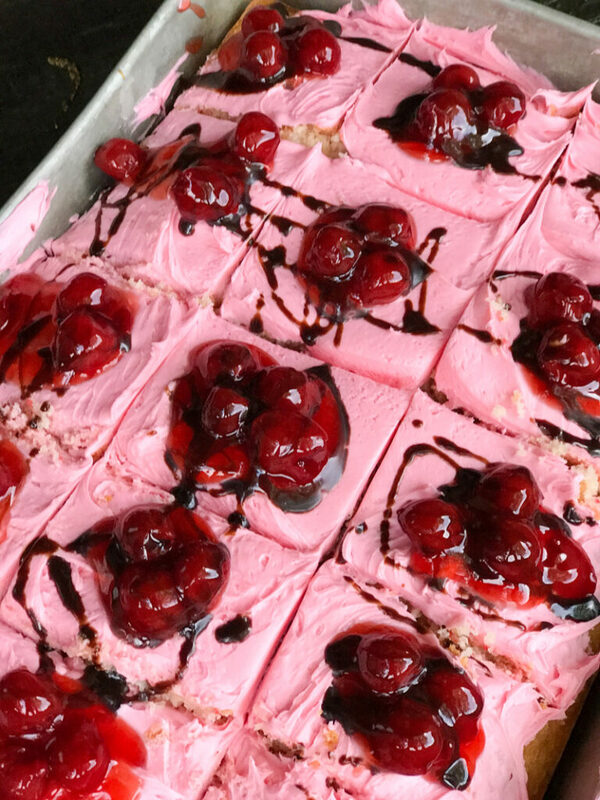 Ready to make or print this Chocolate Covered Cherry Snack Cake? Made with an easy cake mix, taken to another level with some delicious chocolate sauce, a homemade cherry frosting and cherry pie filling. Tart, sweet and decadent. A favorite romantic dessert idea. 1 can cherry pie filling, 20 oz. In a large mixing bowl, mix the cake mix, nonfat vanilla yogurt and water together on medium about 2 minutes or until well blended. Spray a 9x13 cake pan with cooking spray and pour cake batter into pan. Bake at 350 degrees F about 15-20 minute or until a toothpick inserted comes out clean. Cool completely before adding frosting. In a mixing bowl, beat the butter until fluffy. Add in the maraschino cherry juice, almond extract and red food coloring if desired, continue beating. Add the powdered sugar slowly a little at a time until you have reached desired consistency. 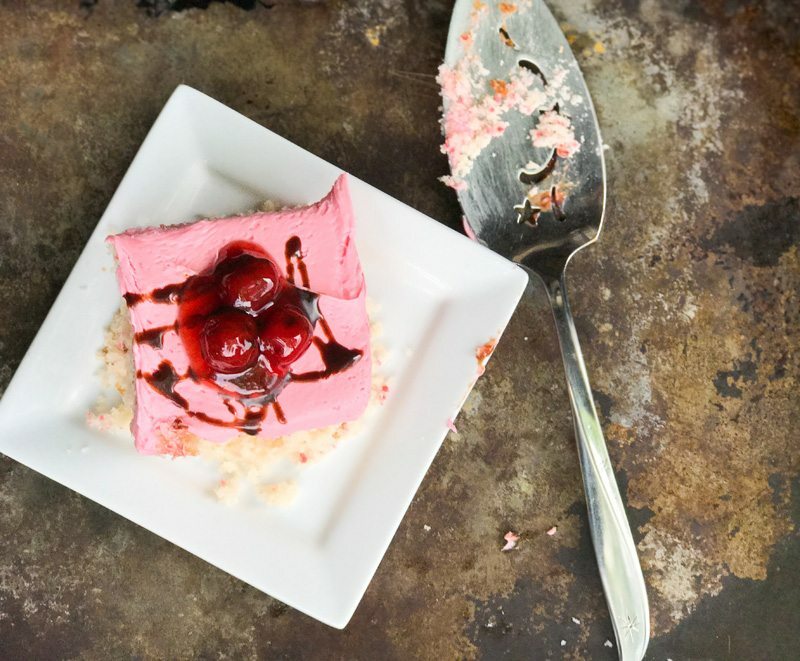 When cake is cooled completely, frost cake with Cherry Frosting. Spoon cherry pie filling on top. We sliced our cake first and then added a spoonful to each piece. Drizzle chocolate on top of the cherry pie filling.